Definition at line 33 of file cfpython_region.h. Definition at line 35 of file cfpython_region.h. 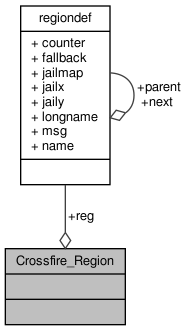 Referenced by Crossfire_Region_GetJailPath(), Crossfire_Region_GetJailX(), Crossfire_Region_GetJailY(), Crossfire_Region_GetLongname(), Crossfire_Region_GetMessage(), Crossfire_Region_GetName(), Crossfire_Region_GetNext(), Crossfire_Region_GetParent(), Crossfire_Region_InternalCompare(), and Crossfire_Region_wrap().